BIONEXIA® Influenza A+B is a rapid test for the detection of Influenza A and B viruses in human nasopharyngeal specimens. Influenza (commonly known as flu) is a highly contagious acute infection of the respiratory tract. Types A and B are the most common types of human influenza virus. They can circulate simultaneously, but usually one type is dominant during a seasonal epidemic. Although a flu infection is not normally severe, certain populations are at higher risk of developing complications. Rapid, accurate diagnosis means reducing the risk of transmission and outbreak, preventing inappropriate antibiotic use and ensuring early prescription of antiviral medication for high-risk patients. 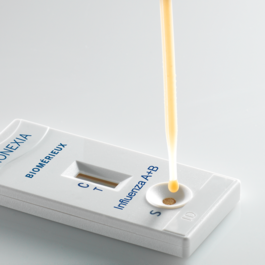 The BIONEXIA® Influenza A+B rapid test is extremely easy-to-use, reliable4,5 and cost-efficient6 . Positive results are indicated by 2 or 3 distinct colored lines depending on the type of antibody present: red line for Influenza A and/or blue line for Influenza B. The green control line must always be present. Robinson JL, et al. Use of Throat Swab or Saliva Specimens for Detection of Respiratory Viruses in Children. CID 2008; 46 : e61-e64. Daley P, et al. Comparison of Flocked and Rayon Swabs for Collection of Respiratory Epithelial Cells from Uninfected Volunteers and Symptomatic Patients. J Clin Microbiol. 2006; 44 (6): 2265-2267. Picard C, et al. Comparative Evaluation Of BIONEXIA® Influenza A+B To QuickVue® Influenza A+B Test For The Detection Of Influenza In Pediatric Samples. Poster presented at ESPID congress May 28-June1, 2013. Milan, Italy. Kits are for professional use in laboratories. Consult your local bioMérieux representative for product availability in your country.